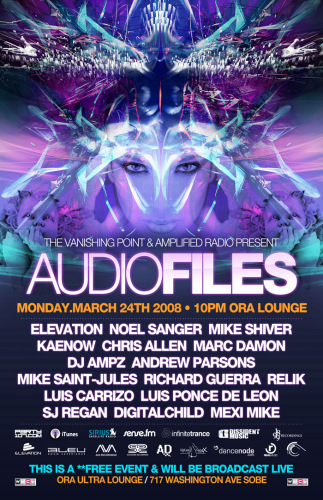 "AudioFiles" LIVE from Miami with Mike Shiver, Elevation, Noel Sanger, Kaenow, DJ Ampz, and many more! UPDATE: Due to circumstances entirely beyond everyone's control, the LIVE broadcast from AudioFiles in Miami will most likely not be happening tonight. This is due to the Internet connection being completely out at the club. The AudioFiles team is doing their best to still work on this, however as it stands now the LIVE broadcast tonight is canceled. Stay tuned for updates. Above times Eastern USA (GMT -4 due to daylight saving time). Click times to see them in your timezone. 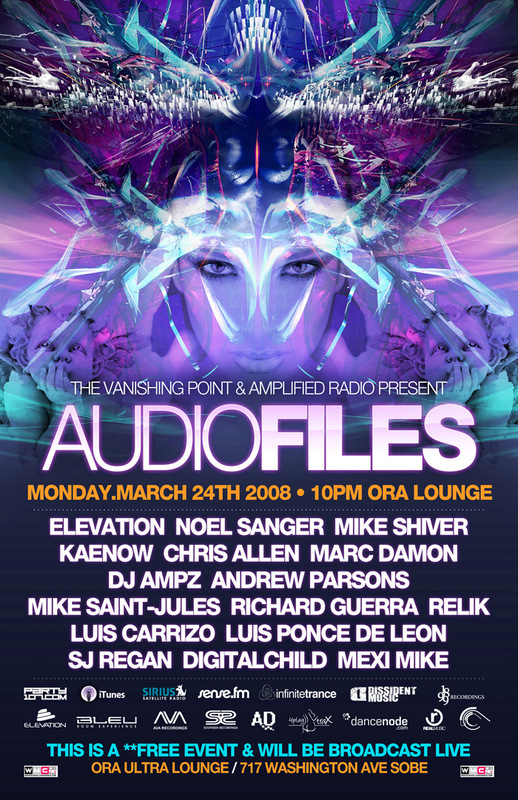 If you will be in Miami for WMC we invite you to stop by for a great night of music! The address is 717 Washington Ave, Miami, FL. The main room will be broadcast LIVE on Party107 starting at 10:00 PM Eastern / 03:00 CET (Tuesday) / 02:00 UK (Tuesday) and going until ~5 AM. Also tune in before the show starting at 6 PM Eastern for The Vanishing Point 118 pre-show with Suzy Solar, Digitalis, Diego Parra, and Ben Goranson!